Fielder Electrical Services, Inc. is a full-service electrical company that offers industrial and commercial electrical services in St. Louis, MO. Our licensed electricians are trained to handle commercial projects of any capacity, including lighting installations and multimedia wiring for computers and Internet systems. Your business can count on us for any type of electrical need! We specialize in interior and exterior lighting designs for parking lots, security and landscaping. Our electrical services include installations for battery backup systems and Category 5 wiring. CAT 5 wiring installations properly connect various types of technologies and electronics such as computers, Internet, satellites and voice and data services. We'll make your communication systems convenient and efficient. Our electricians are properly equipped and on call to handle any type of industrial requirement. Our industrial services include electrical inspections and maintenance, energy-efficient lighting solutions and wiring for any type of machinery. 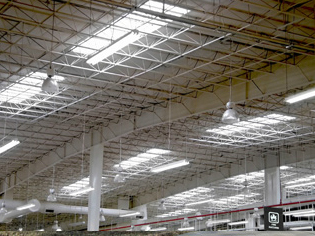 We'll ensure that your facility or warehouse has the most up-to-date electrical systems. Call Fielder Electrical Services, Inc. for an experienced industrial and commercial electrician in St. Louis, including Chesterfield, Frontenac, Ballwin, Kirkwood, Town and County, Ladue, Manchester, Webster Groves, Fenton, Des Peres, Oakville, Sunset Hills, Mehlville, Affton, University City, St. Charles, Jefferson Counties and South County, Missouri.